The Aroostook River flows open near the Washburn Road in Presque Isle on Sunday. Ice broke on parts of the river over the weekend, sending chunks of ice floating down the Presque Isle Stream. The Aroostook County Emergency Management Agency reported that the Bridgewater Fire Department closed the road about 7:25 p.m.
Packard Road runs about four miles to the northwest off Route 1 and crosses the south branch of Three Brooks and Dead Brook Stream shortly before coming into the town’s center. Firefighters went door-to-door to inform residents, the agency said. It was not clear Monday morning when the road could reopen. Following the warmest weekend since last fall and an expected inch of rainfall Monday, the National Weather Service in Caribou issued a flood watch for parts of the region, including a flood advisory for the Aroostook River in Washburn. 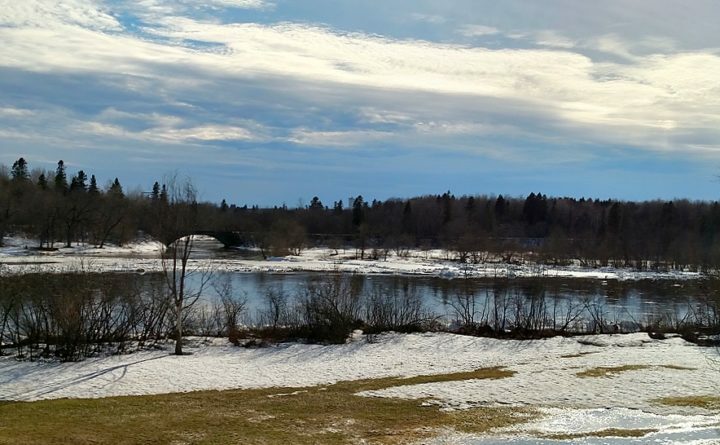 “The potential exists for minor flooding, especially along low lying areas along the Aroostook River in Washburn and Wade,” the National Weather Service said. The National Weather Service and the Aroostook County Emergency Management Agency said drivers should never to cross a road that is or seems to be flooded. The Aroostook County Emergency Management Agency Director Darren Woods suggested County residents check out the Aroostook County Flood Watch Facebook page, launched with the purpose of notifying folks of any floods. The page contains notifications about potential flooding emergencies and the public is also welcome to submit pictures of floods or bodies of water that are near flooding. In addition, people looking to find out about road conditions, should visit the traveller information system website New England 511 at newengland511.org.